Could a cybernetic implant really help you lose weight? Forget about fad diets and surgery. Researchers from ETH-Zurich have come up with a potential high-tech solution to the ongoing obesity epidemic: An implantable slimming aid that monitors fat in the blood. In response to elevated levels, it produces a substance that tells the body that it's not hungry. 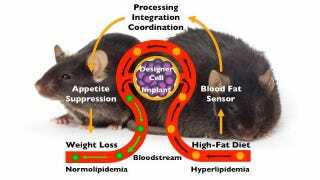 The implantable genetic circuit, which has only been tested on obese mice, was put together using mostly human biological components. It essentially performs two functions: monitoring the circulating fat levels in the blood, and then, in the event of detecting excess levels, produces a messenger substance that conveys an "I'm not hungry" cognitive response (or satiety). To create this regulatory circuit, the bioengineers combined several genes that generate particular proteins and reactions. This compound was inserted into tiny capsules, and then implanted into obese mice. During the ensuing experiment, the mice were continually given high-fat foods. "Instead of placing the mice on a diet to achieve weight loss, we kept giving the animals as much high-calorie food as they could eat," noted ETH-Zurich professor Martin Fussenegger in a statement. The implants kicked in as expected, causing the obese mice to stop their excessive eating. Their bodyweight dropped noticeably as a result. Once their blood-fat levels returned to normal, the implant stopped producing the fullness signal. As for the control group, mice that received normal animal feed with a 5% fat content did not lose any weight or reduce their intake of food. Interestingly, the sensor can detect different types of fat, including saturated and unsaturated animal and vegetable fats — even when they're all ingested at the same time. But the researchers caution that this development is not easily transferable to humans and that it'll take several more years to develop a human-friendly version. Read the entire study at Nature: "A closed-loop synthetic gene circuit for the treatment of diet-induced obesity in mice".